Smell, called olfaction, is the ability of an organism to sense and identify a substance by detecting tiny amounts of the substance that evaporate and produce an odor. Smell is the most important sense for most organisms. Many species use their sense of smell to locate prey, navigate, recognize and communicate with others of their species, and mark territory. cavity of the nose. 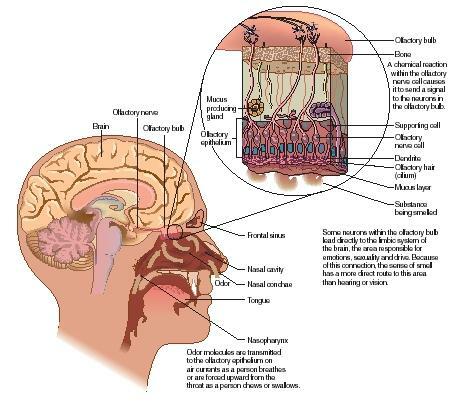 The olfactory epithelium contains millions of odor-sensitive olfactory nerve cells that are connected to the olfactory nerves. Hairlike fibers on the end of each olfactory cell react to an odor by stimulating the olfactory cells to send a signal along the olfactory nerve to the brain, which interprets the signal as a specific smell. There is no doubt that many animals have a sense of smell far superior to that of humans. Most vertebrates (animals with backbones) have many more olfactory nerve cells than humans. This probably gives them much more sensitivity to odors. Also, the structure in the brain that processes odors (called the olfactory bulb) takes up a much larger part of the brain in animals than in humans. Thus, animals have a greater ability to process and analyze different odors. This is why humans use dogs to find lost persons, hidden drugs, and explosives—although research on "artificial noses" that can detect scent even more reliably than dogs continues. Still, the human nose is capable of detecting over 10,000 different odors, even some that occur in extremely minute amounts in the air. Many researchers are considering whether smell does not play a greater role in human behavior and biology than has been previously thought. For instance, research has shown that human mothers can smell the difference between clothes worn by their baby and those worn by another baby only days after the child's birth. Olfactory bulb: The primitive part of the brain that first processes olfactory information. Olfactory epithelium: The patch of mucous membrane at the top of the nasal cavity that contains the olfactory nerve cells. Olfactory nerve cell: A cell in the olfactory epithelium that detects odors and transmits the information to the brain. Pheromone: Scent molecules released by animals that affect the behavior of organisms of the same species. Scientists are only beginning to understand the role that smell plays in animal—and human—behavior. For example, animals release chemicals called pheromones to communicate danger, defend themselves against predators, mark territory, and attract mates. Some researchers have suggested that humans also may release pheromones that play a role in sexual attraction and mating—although this hypothesis has not been proven. Olfactory nerve cells are the only nerve cells arising from the central nervous system that can regenerate (be formed again). Some researchers hope that studying regeneration in olfactory nerve cells or even transplanting them elsewhere in the body can lead to treatments for spine and brain damage that is currently irreversible. I am not a trained medical person but one who is desperately searching find help to her sinus problems. I am interested to know if these epith. cells can be damaged by toxins such as mold and if so would it make the nose feel like it was burning. Also if they would cause pain in the interior of the nose. I was exposed to mold for over 6 molds, lived in the space. My nose would burn and I could not breath without opening a window but did not recognize the systoms not having experienced the systems before. We looked and had stuff changed until the source finally showed itself. Of course the whole house was just about replaced but I continue to have the issues with my nose. In addition my sense of smell has been changed,there are some thing I just can't smell. I have been to many ENT's because I have chronic sinsus problems-but never have I had this pain in the nose until the mold. I believer I have allergic sinusites but and have been on many serious of antibotics but my latest CAT scan shows no active infection but the trinagle of on my face continues to burn. I am suffering and can't seem to find a doctor. None of the doctors seem to even consider the mold aspect. When I was 19 years old I was involved in a traffic accident and suffered a depressed fracture to my forehead and back of my skull. My nose was broken. In the first week of recovery I completely lost my sense of taste and smell, however thankfully taste came back, but sadly my sense of smell deserted me completely even the memory of smell, it never came back although for the first couple of years strange smell sensations wafted within my nose but after that nothing. Many years later and now in middel age I still yearn to have my smell back, that yearning never leaves you. I wish there was something that could be done to reconnect those nerves.